Harakiri (切腹, Seppuku, 1962) is a 1962 Japanese jidaigeki (period-drama) film directed by Masaki Kobayashi. The story takes place between 1619 and 1630 during the Edo period and the rule of the Tokugawa shogunate. It tells the story of Hanshirō Tsugumo, a warrior without a lord. At the time, it was common for masterless samurai, or rōnin, to request to commit seppuku (harakiri) in the palace courtyard in the hope of receiving alms from the remaining feudal lords. Edo, 1630. Tsugumo Hanshirō arrives at the estate of the Ii clan and says that he wishes to commit seppuku within the courtyard of the palace. To deter him Saitō Kageyu (Rentarō Mikuni), the Daimyō's senior counselor, tells Hanshirō the story of another rōnin, Chijiiwa Motome – formerly of the same clan as Hanshirō. Saito scornfully recalls the practice of ronin requesting the chance to commit seppuku on the clan's land, hoping to be turned away and given alms. Motome arrived at the palace a few months earlier and made the same request as Hanshirō. Infuriated by the rising number of "suicide bluffs", the three most senior samurai of the clan—Yazaki Hayato, Kawabe Umenosuke, and Omodaka Hikokuro—persuaded Saitō to force Motome to follow through and kill himself. Upon examining Motome's swords, their blades were found to be made of bamboo. Enraged that any samurai would "pawn his soul", the House of Ii forced Motome to disembowel himself with his own bamboo blade, making his death slow, agonizingly painful, and deeply humiliating. Despite this warning, Hanshirō insists that he has never heard of Motome and says that he has no intention of leaving the Ii palace alive. After a suicide pavilion is set up in the courtyard of the palace, Hanshirō is asked to name the samurai who shall behead him when the ritual is complete. To the shock of Saitō and the Ii retainers, Hanshirō successively names Hayato, Umenosuke, and Hikokuro—the three samurai who coerced the suicide of Motome. When messengers are dispatched to summon them, all three decline to come, saying they are suffering from a life-threatening illness. After provoking their laughter by calling bushido a facade, Hanshirō recounts his story to Saitō and the Ii retainers. He did, he admits, know Motome after all. In 1619, his clan was abolished by the Shōgun. His Lord decided to commit seppuku and, as his most senior samurai, Hanshirō planned to die alongside him. To prevent this, Hanshirō's closest friend performed seppuku and left a letter assigning to Hanshirō the guardianship of his teenage son—Motome. Despite Hanshirō's pleas, his Lord forbade him to kill himself. In order to support Motome and his own daughter Miho, Hanshirō rented a hovel in the slums of Edo and was reduced to making paper umbrellas to make ends meet. Despite this, he retained a firm sense of personal and familial honor. Realizing the love between Motome and Miho, Hanshirō arranged for them to marry. Soon after, they had a son, Kingo. When Miho fell ill with a fever, Motome could not bear the thought of losing her and did everything to raise money to hire a doctor. When Kingo also fell ill, Hanshirō was enraged when Motome claimed to have already sold everything of value. Motome, however, calmly explained that there was another way to raise money and that he would return very soon. For hours, Hanshirō and Miho anxiously awaited his return. Late that evening, Hayato, Umenosuke, and Hikokuro, had brought Motome's mutilated body home. They explained how Motome had come to the Ii palace and had been forced to kill himself. They then displayed his bamboo blades in order to mock their victim before his family. After they left, Miho spent hours weeping inconsolably over her husband's body. Then, she returned to her sickbed next to Kingo. Having had no idea that Motome had sold even his sword blades to save Miho, a devastated Hanshirō implored his son-in-law's forgiveness for his own carelessness. Soon after, Kingo died from his illness. Having already lost the will to live, Miho followed after him the next day. Completing his story, Hanshirō explains that his sole desire is to join Motome, Miho, and Kingo in the next world. He explains, however, that they have every right to ask whether justice has been exacted for their deaths. Therefore, Hanshiro asks Saito if he has any statement of regret to convey to Motome, Miho, and Kingo. He explains that, if Saito does so, he will die without saying another word. Saitō, however, insists that Motome was "a despicable extortioner" who got exactly what he deserved. He boasts that all other suicide bluffs who come to the Ii palace shall be treated in the same fashion. Hanshirō then reveals the last part of his story. Before coming to the Ii house, he had tracked down Hayato and Umenosuke, easily defeated them, and cut off their topknots. Hikokuro then came to Hanshirō's hovel and, with great respect, challenged him to a duel. After a brief but tense sword fight, Hikokuro suffers a double disgrace: his sword is broken and his topknot was taken as well. As proof of his story, Hanshiro removes their labelled topknots from his kimono and casts them upon the palace courtyard. With deep contempt, Hanshiro reminds everyone that, for a samurai to lose his topknot is a disgrace so horrendous that even suicide can barely atone for it. And yet, the most revered samurai of the House of Ii —Hayato, Umenosuke, and Hikokuro— lack the fortitude to commit the suicide they would demand from anyone else. Instead, they are concealing their dishonor, feigning illness, and waiting for their hair to grow back. Hanshiro concludes that, despite the Ii clan's pride in its martial history, it seems that the Code of the Samurai is a facade even for them. Having now lost face very badly, an enraged Saitō calls Hanshiro a madman and orders his remaining samurai to kill him. In a battle which rages through the palace, Hanshirō kills four samurai, wounds eight, and contemptuously throws down the antique suit of armor which symbolizes the glorious history of the House of Ii. In a final confirmation of the clan's Machiavellian ways, three Ashigaru arrive armed with matchlock guns—a weapon seen as beneath contempt. As Hanshirō begins seppuku, he is simultaneously shot by all three gunmen. Terrified that the Ii clan will be abolished if word gets out that "a half starved ronin" killed so many of their retainers, Saito announces that all deaths caused by Hanshiro shall be explained by "illness". Hayato, Umenosuke, and Hikokuro are to atone for losing their topknots by committing seppuku. Saito angrily orders that a squad of soldiers are to be sent to their houses "to make sure they do it." As the suit of armor is lovingly re-erected, the visitor's book of the House of Ii clan is heard in voiceover. Hanshiro, who was clearly mentally unstable, had to be forced, like Motome before him, to commit suicide. The Shōgun, it is said, has issued a personal commendation to the Ii clan for how they handled the suicide bluffs of Motome and Hanshiro. At the end of his letter, the Shōgun praises the House of Ii and their samurai as the perfection of the Code of Bushido. Janitors clean the grounds where the fighting had occurred, and a janitor finds one of the three severed top knots on the ground. He places it in a bucket. The film presents a negative view of the emerging feudal system at the beginning of the 17th century, depicting the hypocrisy in the flimsy pretext of honor exhibited by the daimyō. At the time, seppuku was seen as a means to retain one's honor after a disgrace or after losing ones daimyō or master. The vanity of the feudal lord's counselor Saitō is also shown: the outward appearance of honor is shown to be more important to him than real honor. He orders the retainers disgraced by Hanshirō to perform seppuku, and makes sure that those who were slain or had their topknots cut off by Hanshirō are written off as casualties to illness so that his house would not appear weak. An ironic commentary appears when Hanshirō is able to fight off a great many retainers with a sword, yet is helpless against three guns; a foreshadow of the Meiji Restoration, wherein sword-bearing samurai were defeated by the "new" Japanese military. Harakiri was released in Japan in 1962. The film was released by Shochiku Film of America with English subtitles in the United States in December 1963. In a contemporary review, the Monthly Film Bulletin stated that Masaki Kobayashi's "slow, measured cadence perfectly matches his subject" and that the "story itself is beautifully constructed". 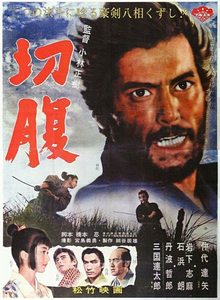 The review praised Tatsuya Nakadai's performance as "brilliant, Mifune-like performance" and noted that the film was "on occasion brutal, particularly in the young samurai's terrible agony with his bamboo sword" as "some critics have remarked...that being gory is not the best way to deplore wanton bloodshed, Harakiri still looks splendid with its measured tracking shots, its slow zooms, its reflective overhead shots of the courtyard, and its frequent poised immobility."". From contemporary reviews, Roger Ebert added Harakiri to his list of "Great Movies." He writes "Samurai films, like westerns, need not be familiar genre stories. They can expand to contain stories of ethical challenges and human tragedy. Harakiri, one of the best of them, is about an older wandering samurai who takes his time to create an unanswerable dilemma for the elder of a powerful clan. By playing strictly within the rules of Bushido Code which governs the conduct of all samurai, he lures the powerful leader into a situation where sheer naked logic leaves him humiliated before his retainers." On Rotten Tomatoes, the film has a 100% rating based on eight critic reviews, with an average rating of 8/10. The film was entered in the competition category at the 1963 Cannes Film Festival. It lost the Palme d'Or to The Leopard, but received the Special Jury Award. The movie was remade by Japanese director Takashi Miike as a 3D movie named Hara-Kiri: Death of a Samurai in 2011. It premiered at the 2011 Cannes Film Festival. ^ a b c d e f g h i Galbraith IV 1996, p. 207. ^ For the difference between the terms harakiri (腹切り) and seppuku (切腹), see etymology. ^ John Berra (2012). Japan 2. Intellect Books. pp. 151–153. ISBN 978-1-84150-551-0. ^ a b "Seppuku (Harakiri), Japan, 1962". Monthly Film Bulletin. Vol. 32 no. 372. London: British Film Institute. 1965. pp. 71–72. ^ a b c Ebert, Roger (February 23, 2012). "Honor, morality, and ritual suicide". Chicago Sun-Times. Retrieved March 2, 2012. ^ "Harakiri (1962)". Rotten Tomatoes. Retrieved 9 September 2016. ^ "Festival de Cannes: Harakiri". festival-cannes.com. Retrieved 2009-02-27. "切腹 (Seppuku)" (in Japanese). Japanese Movie Database. Retrieved 2007-07-16.